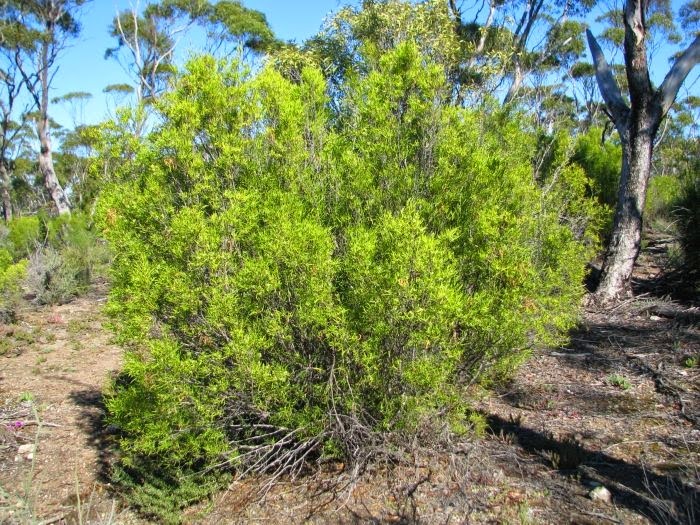 This bushy shrub to 3 metres (10’) in height is also known as Sheep-bush, probably because sheep will eat it, as do camels. 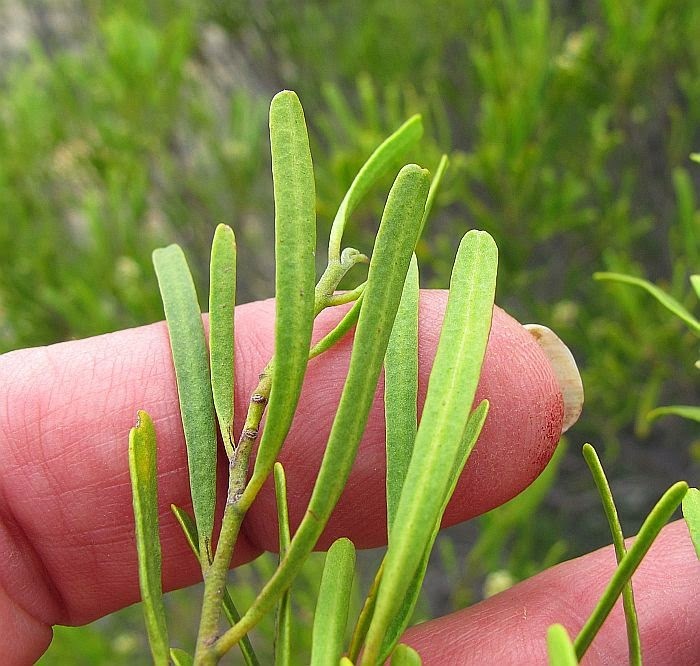 It is part of the Rutaceae family, which includes many ornamental species like Boronia, Correa, Eriostemon, Phebalium, etc (G. linearifolia was once placed in the Eriostemon genus). 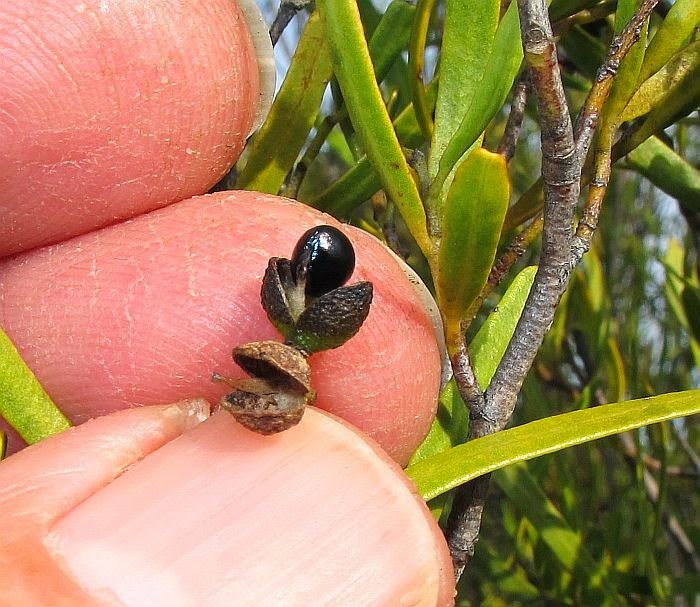 It also contains the commercially important Citrus group, like Oranges, Lemons, Grapefruit, Limes, etc., so Geijera linearifolia belongs to a commercially very important family. 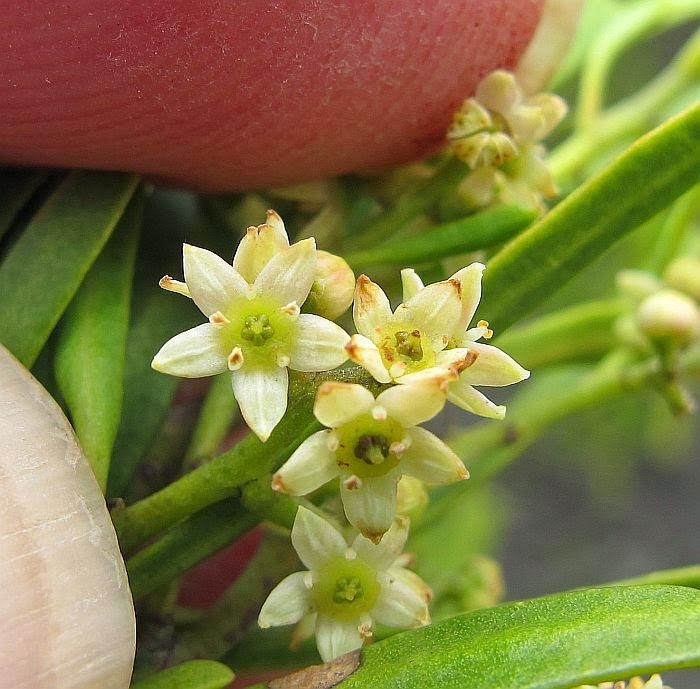 Unfortunately Geijera linearifolia has few of the above attributes, except it is a very tough bushy shrub, inhabiting exposed clay/gypsum rises on and around saltlakes, or shallow clay based soils over limestone, both very demanding habitats. It has narrow upright pale green leaves to 5 cm (2”) in length and numerous small white/cream flowers, which eventuate into shiny black seeds. 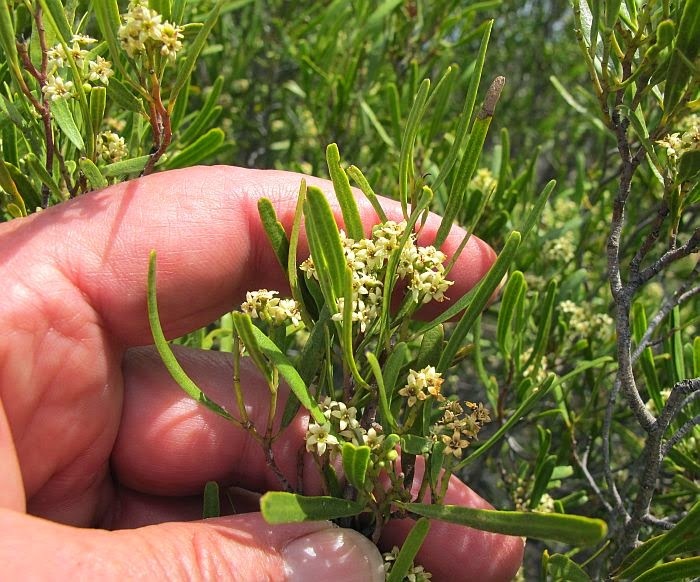 Often they are the only large shrub growing in the exposed open spaces of their harsh habitat, which is probably why it is often recommended for street and screen planting in SA where it is ideally suited to their dry limestone soils. It is distributed from the NW of Esperance (primarily around saltlakes), to the NE of Esperance where a mallee limestone substrate is widespread. 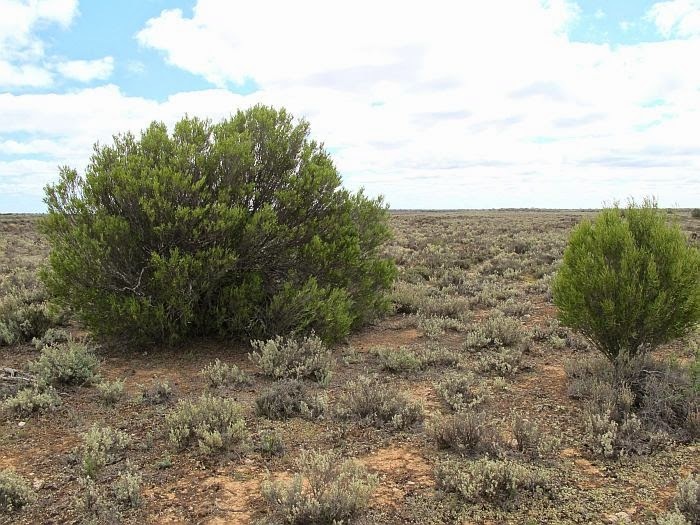 Naturally with its limestone preference, it is also spread across the Nullarbor into SA where it is common in the lower half of the State as far as the NW Victorian boarder. 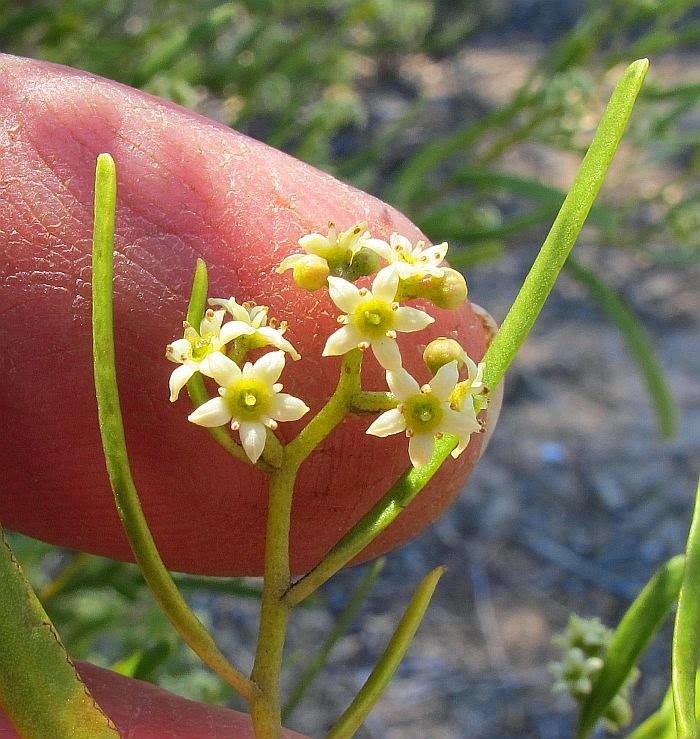 Flowering in WA is recorded from August to November, although I have encountered them with mature seed in July, so possibly the flowering period on occasion may be extended during cooler summers. Geijera is part of the highly diverse Rutaceae family.